John R. "Johnny" Cash (February 26, 1932 – September 12, 2003), born J. R. Cash, was an American singer-songwriter, actor, and author, who has been called one of the most influential musicians of the 20th century. Although he is primarily remembered as a country music artist, his songs and sound spanned many other genres including rockabilly and rock and roll—especially early in his career—as well as blues, folk, and gospel. Late in his career, Cash covered songs by several rock artists, among them the industrial rock band Nine Inch Nails and the synthpop band Depeche Mode. Johnny Cash was known for his deep, distinctive bass-baritone voice; for the "boom-chicka-boom" freight train sound of his Tennessee Three backing band; for his rebelliousness, coupled with an increasingly somber and humble demeanor; for providing free concerts inside prison walls; and for his dark performance clothing, which earned him the nickname "The Man in Black". He traditionally started his concerts by saying, "Hello, I'm Johnny Cash." and usually following it up with his standard "Folsom Prison Blues." Much of Cash's music, especially that of his later career, echoed themes of sorrow, moral tribulation and redemption. 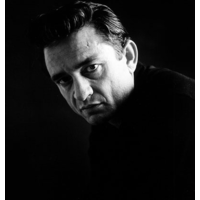 His signature songs include "I Walk the Line", "Folsom Prison Blues", "Ring of Fire", "Get Rhythm" and "Man in Black". He also recorded humorous numbers, such as "One Piece at a Time" and "A Boy Named Sue"; a duet with his future wife, June Carter, called "Jackson"; as well as railroad songs including "Hey, Porter" and "Rock Island Line". Cash, a devout but troubled Christian, has been characterized as a "lens through which to view American contradictions and challenges." A Biblical scholar, he penned a Christian novel entitled Man in White, and he made a spoken word recording of the entire New King James Version of the New Testament. Even so, Cash declared that he was "the biggest sinner of them all", and viewed himself overall as a complicated and contradictory man. Accordingly, Cash is said to have "contained multitudes", and has been deemed "the philosopher-prince of American country music".